Completely updated condo since IRMA! EVERYTHING IS BRAND NEW! Living room furniture and tables are new also. Photos soon to come! Rent in Paradise At Sea Isle. Ocean Front Corner Unit with a Billion Dollar View!! NEW~40inch LED Smart TV!! & 2 new 32inch LED TV, NEW BEDS & BED SPREADS!!!! This is what the keys are all about. 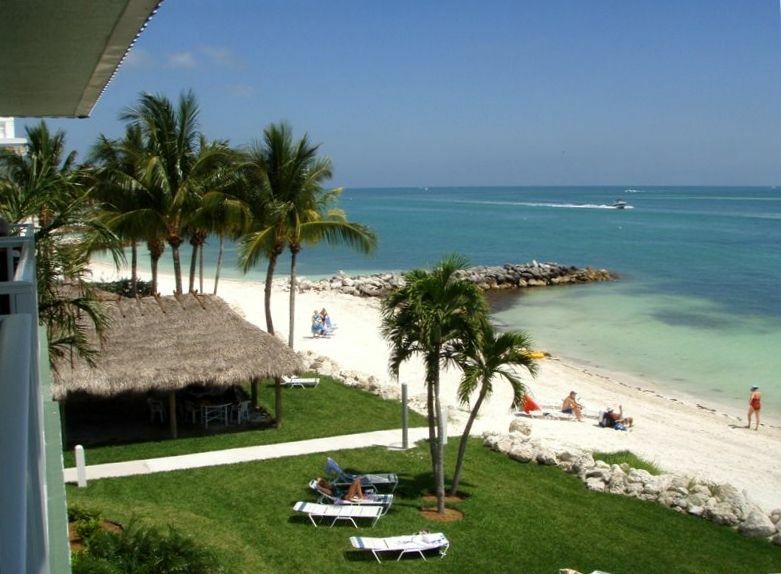 Centrally located two hours from Miami Airport and one hour to Key West. Sip your morning coffee on our balcony with a billion dollar view of the tranquil green and blue Atlantic Ocean and 175 feet of white sandy beach. Swim in our heated pool or sun on our lounge chairs. Dine out or cook your catch of the day by our tiki hut, with grills tables, chairs, and rustling palms. If luck has it you can enjoy a dolphin show or tarpon roll right off the jetties while you dine. As our personal vacation home this two bedroom, two bath condo is immaculate, maintained and equipped to make your stay comfortable. It can accommodate two to four people (two full beds and a king bed), laundry facility on premise, sorry no pets. We are walking distance to a 9 hole golf course, two parks, tennis courts, jogging path, restaurants, full marina, dive center, deli's and shops. I moved to beautiful south Florida. My family and I are from New Jersey. We love spending time together in our favorite place in the keys. We also like skiing and snowboarding out west. It is the most beautiful place I've ever had a chance to see. Watching the Dolphins swim pass the condo in the morning off our balcony!! Snokeling in front of the condo and finding amazing couchs, starfish, sand dollars and much more! Only condo's in complex that are beach and ocean front are # 9, 1, 5, 6, 10! Netflix on TV and Internet TV in Main Room. With all Brand New Appliances!!! (3) Infinity Comcast! PLUS NETFLIX!!!! Beautiful balcony overlooking the ocean from the living room. You can rent right down the street for your time there! But no elevator for stairs and bathrooms not wheelchair accessible. There is a suffle board court and a tiki bar on site. The pool on site is heated for winter rentals. It was our first visit to the keys and we agree with Angela E, that we traveled from key largo to key west and never found a more perfect spot. We came to the keys to celebrate our 25th anniversary and we can not say enough wonderful things about this rental. Beginning with the booking process through Kristen, right up until we left....vowing to return asap!!! The condo had everything we needed and was comfortable....but the real gift was the view!!! Over the top amazing! In fact so amazing, we are having the pictures taken from the balcony, printed to canvas! The snorkeling off of the private beach was awesome and floating in the cove under the moonlight was relaxing and romantic. This is the perfect setting and we did not want to leave. Thank you so much for sharing paradise with us. we stayed here in March 2012 with kids age 9 and 6. it was our first visit to the keys and we traveled from key largo to key west and never found a more perfect spot to make our home for the week. every amenity is included and the condo is better than pictures - spotless and the caretaker is a gem. we had the beach to ourselves and at most shared it with two other families that became friends of ours. the pool is great but you don't need it with the swimming and snorkeling that can be done right from the beach. we loved walking to the restaurants, coffeehouse, and dive shop right on KCB. my husband and son surfcasted from the beach and caught all sorts of jack, snapper, and even a tasty hogfish. thank you so much for sharing this slice of heaven with others. our family stayed here last August and it was just perfect. Best Money I Ever Spent!! Sea Isle Condominium was without a doubt worth every cent. I enjoyed every moment of it. Great prices for food and drinks. I most certainly recommend it to anyone that wants to relax and have a good time for a great price. Whether you're just chilling by the pool or going on adventures, I promise you'll have a good time. Staying here reminded me of the time I was relaxing on the beaches of Thailand. It was so beautiful and relaxing from morning til night. I loved waking up in the morning, making breakfast and sipping my coffee on the balcony over looking the ocean and listening to the waves. Dining and bars are within walking distance from the Condo which makes it worry free when having to find a way home after a fun night out. Sunset park is a great place to watch the sun set, located right next door. If you're an active sports player, there is a tennis court and a golf course near by. Even if you want to try something new and play 9 holes instead of the long 4 hours of 18 holes. Perfect for a morning game or a quick afternoon game. I highly recommend this location and when given the opportunity, I would love to stay here again. My family and I had an amazing time at this condo. It was a great place to teach my children how to fish and sail. All the local food places served fresh fish and you are even able to bring your own fish you caught and they'll cook it for you at a good price. Other renters and owners, we met by the pool were very friendly and great to be around. My wife and daughter played a great game of tennis almost every night at the local park. Sunset bar & grill, over by the 7-mile bridge has fantastic food and a pool available for anyone hanging out there. Biking the 7-mile bridge to pigeon key was also awesome. We went very early in the morning and saw thousands of fish, sharks, tarpon and string rays from above!! We truly enjoyed every second down there! Cleaning & Taxes are INCLUDED in Price.